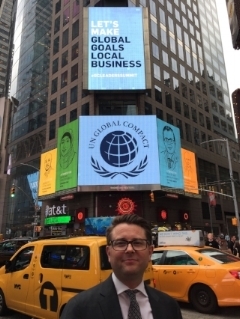 In 2016, Ulysses was recognized by the UN Global Compact as one of ten SDG Pioneers for his efforts that align with Sustainable Development Goal 16, on Peace, Justice and Strong Institutions. In September 2017, Ulysses was appointed Special Advisor to the UN Global Compact on Anti-Corruption and Global Governance. Ulysses is active in a variety of international legal forums, including serving as chair of the New York City Bar Association’s Task Force on Good Governance in the Secretary – General Selection; and previously serving as chair of the United Nations Committee of the New York City Bar Association. He has addressed the UN General Assembly on legal issues related to Western Sahara. Frequent speaker and author on issues of governance and development, multilateralism, rule of law, Ulysses has addressed the UN General Assembly on legal issues related to Western Sahara, and is a frequent speaker at law schools on the role of lawyers in contributing to good governance and sustainable development. Ulysses is a 2007 graduate of Cornell Law School, where he was Managing Editor of the Cornell Law Review, and a member of the New York Bar.